Do you want to use your air conditioners in a smarter way? Do you want to cool your room from anywhere using your smartphone and create custom cooling schedules based on your daily activities? If any, smart air conditioners are for you. A smart air conditioner means you can turn the cooling unit on before you get home, you can control it from afar using a mobile app or voice commands – the only thing you need is a WiFi connection. Moreover, some smarter models can tell you how much power the AC has used and your daily and monthly costs which allow you to control your electric bills and save money. What is a smart air conditioner? 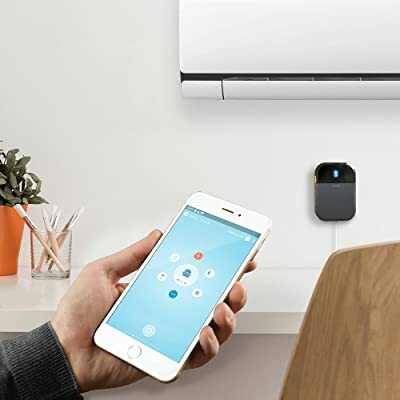 A smart air conditioner, as the name suggests, is an electronic AC that is able to connect to the internet and thereby controllable by a mobile app on your smartphone. Using smart air conditioners means you can manage and monitor the air conditioner’s status and a range of settings from anywhere and anytime. The only thing you need is a compatible Android or iOS smartphone and Wi-Fi connection, sure. If you’re ready to beat the heat with a smart air conditioner, you’ll want to know what is the best smart air conditioner and where can you get one before you head to the shops. Read our unbiased reviews to find out. A window air conditioner, or a room air conditioner is the most common cooling solution for a single room. It is also the most economical choice and very easy to install. The Frigidaire Gallery Smart Window AC is the best app-enabled window air conditioner currently available. The good-looking modern design is only the beginning of its many great features. With Wifi control, you can begin cooling down your home from anywhere using an iOS or Android mobile app, and you can create custom cooling schedules based on your daily activities. It also works with Google Assistant and Amazon’s Alexa voice assistant, meaning you can use your voice to control just about everything the app can. By simply speaking to your voice assistant, you can turn the unit on and off, set a temperature, raise and lower the temperature. For instance, if you’ve got an Amazon Echo, you can say: “Alexa, set the temperature to 75” or “Alexa, turn on the air conditioner” to turn the unit on. The Frigidaire FGRC0844S1 provides 8,000 Btu of cooling capacity which is capable of cooling rooms up to 350 square feet with 1.7 pints per hour dehumidification. This unit is an Energy Star qualified device so it requires 15 to 20 percent less energy than the one without that certification. With an impressive energy efficiency ratio (EER) of 12 and an estimated annual cost only about $60, this unit is one of the most efficient 8000 Btu window air conditioners on the market. You can truly relax knowing your battle against summer heat and humidity is environmentally friendly and cost-effective. The Frigidaire Gallery Smart Window AC is one of the best-looking window ACs we’ve ever seen. It features a white exterior, a modern mesh grill, LED lighting, and 2-directional innovative slanted louvers that direct airflow in an upward circular motion for even cooling of the entire room. This unit is relatively compact, it measures 13.5 by 18.5 by 16 inches (HWD) and weighs just 53 pounds. It can be installed in double hung windows with openings of up to 14 inches high and 23 to 36-inches wide. This unit has been listed as one of the smallest window air conditioners in our previous review. Another innovative feature is the antibacterial mesh air filter which captures bacteria, room odors, and other particles for a cleaner, fresher environment. The new magnetic closure makes removing and cleaning it a breeze. The Frigidaire Smart App keeps you informed and notifies you when the filter needs to be cleaned. The Aros smart air conditioner is a co-branded product from 8-year-old startup Quirky and 120-year-old company GE. This unit is a Wi-Fi connected air conditioner with the Wink app that lets you control the AC from anywhere. A clean white and modern design make it stand out from the rest. That is a good thing, since just about every other window unit on the market shares the same dull design. The Aros was designed by Quirky and manufacturing partner GE. Unlike many other window units that push air out from the front, Aros’s design allows for upward airflow, which maximizes circulation. Its flat, touch-capacitive sensors let you switch between three cooling modes and three fan speeds discreetly, and retractable fabric wings ensure a proper fit in your window. This window air conditioning unit provides 8,000 Btu of cooling capacity that is perfect for a room approximately 350 square feet. It had no trouble quickly cooling down our testing room, which measures about 300 square feet and gets very warm in summer. Quirky claims that this is the smartest window air conditioner you can buy, since this unit can learn from data about your budget, location, schedule, and usage over time to automatically maintain the perfect temperature and maximize savings for your home. Aros connects to your home’s Wi-Fi network using the free Wink app for iOS and Android devices. With Wink app, you can use your phone like a remote. Turn it on when you’re about to get home, or make sure it’s off when you leave. Wink app is one of the best home automation apps, it has a feature that allows you to set a budget for your monthly energy bill. When you get close to your limit, Aros will let you know. And with Wink tracking setting, your window air conditioner can be automatically turned on or off based on your smartphone’s GPS. Overall, the Quirky Aros is a beautiful window air conditioner with an extremely useful companion app. It’s undoubtedly one of the best smart window air conditioners on the market. If you’re looking for a smart window air conditioner for cooling a bedroom, the Friedrich 5,800 BTU Kuhl Series is the best option. This unit is one of the quietest window ACs available with a ultra-quiet operation as low as 43 dB. Kuhl isn’t a built-in smart wifi window AC, but it comes with a FriedrichLink Wi-Fi adapter that makes it controllable by your smartphones, tablets or computers. The FriedrichLink mobile apps (available on Apple’s store and Google Play store) will allow you to turn the unit on or off, control temperature settings, fan speeds, set your timer, and even activate your custom 7-day schedule. Plus, FriedrichLink allows users to create “Groups” of air conditioners, controlling them as one. The most comfortable temperature is the one you never notice. Kühl uses five built-in environmental sensors to more accurately monitor indoor and outdoor temperatures so that it can maintain your ideal settings. Plus, Kühl’s air flow systems are tested for powerful and precise air distribution which means faster cooling when you need it most. This Kenmore Elite window air conditioner has 100 years of trusted Kenmore performance and reliability behind it, but with the added convenience of being “smart.” With the convenience of the Kenmore Smart App, you can easily monitor, control, and maintain your air conditioner from your phone – remotely. For example, if you’re at the office and you want to start a load of laundry before you get home, you can do that with Kenmore Smart App. The App sends your command to the Kenmore Cloud. And then the Kenmore Cloud delivers that command to start your smart washer, all in a matter of seconds. This unit works with Amazon Alexa that allows you to interact with your device simply by voice commands to Amazon’s Echo lineup of speakers and other Alexa-enabled devices. You can say commands like “Alexa, tell Kenmore Smart to set my air conditioner to 70 degrees” or “Alexa, can you raise the temperature?” to make adjustments without having to walk over and do it the old-fashioned way: with buttons. 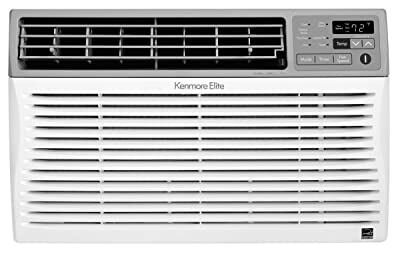 This Kenmore Elite smart window AC unit is designed for cooling a space up to 350 square feet, with a dry setting that uses a dehumidifier to help remove excess moisture from the air. It is Energy Star certified, with an excellent Energy Efficiency Ratio (EER) of 12.1. The best window air conditioners have an EER above 10. With the help of the Kenmore Smart app, you can make sure you only run the AC when you need it so you’ll save energy and money on your utility bills. This unit is also packed with features like electronic controls, 8-way air direction control, 3 cool speeds and 4 fan speeds to help make any space feel great. Overall, our experts tested the Kenmore Elite 8,000 BTU Smart Window AC and it made our top picks list. It’s one of the best additions to your smart home devices list. The Kenmore Elite models are available in a variety of sizes from 8,000 BTUs to 25,000 BTUs. The GE AEC12AV looks like traditional window air conditioners and works in the same way. The difference is that they connect to your local Wi-Fi network, which means wherever you are in the world, if you have internet access, you can use the GE Comfort app to control your air temperature at home. With GE comfort app, you’ll able to create your own 7-day cooling schedule, monitor and control your air conditioner mode and fan settings, choose from available cooling modes, control multiple air conditioners in one convenient app and get reminders to clean or change your air conditioner’s filter. Unfortunately, this unit doesn’t work with the Google Assistant and Amazon’s Alexa voice assistant. The GE AEC12AV is a 12,000 Btu air conditioner, it’s perfect for cooling a 550 square feet room with 3 cooling speeds, a digital thermostat, and 4-way adjustable louvers to direct the airflow right where you need it. Plus, the GE AEC12AV is super efficient with a 12.1 EER (Energy Efficiency Ratio) so you can run it all summer long at minimal cost. 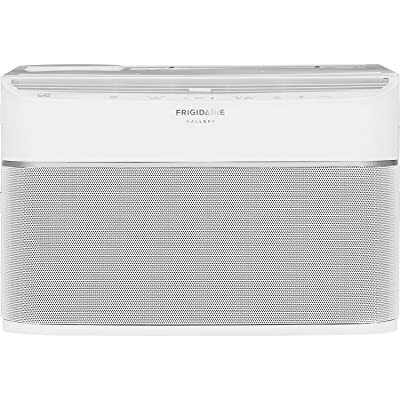 The Frigidaire 12,000 Btu Cool Connect is the best smart portable air conditioner currently available. It doesn’t come cheap, but it offers many great features that you can’t find from other models on the market. This portable unit can be controlled using a mobile app and voice commands. It works perfectly with Amazon Alexa and Google Assistant voice commands. And it does a good job of cooling down rooms of up to 550 square feet. This unit uses the same mobile app (available for Android and iOS) as Frigidaire Gallery 8000 BTU Smart Room Air Conditioner. You can use the app to turn it on and off and set the temperature. The app will also provide you usage reports of your AC that allow you to control your electric bills and save money. 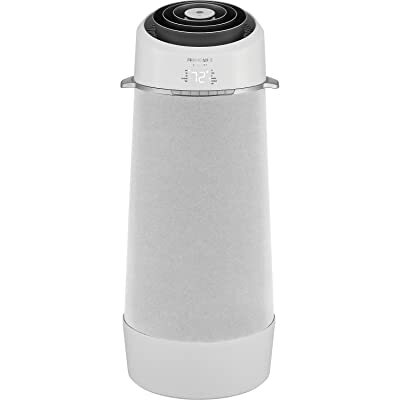 This portable air conditioning unit has an advanced circular airflow that discharges cool air upward in a 360-degree pattern, continuous spiral ensuring it reaches every corner of your room faster. It has an LCD control panel that shows information such as current temperature and setting modes. There are also indicators that tell you when to clean the filters, when the unit is following a schedule, and when it is connected to your home’s Wi-Fi. Overall, Frigidaire is one of the best air conditioner brands on the market that you can trust. 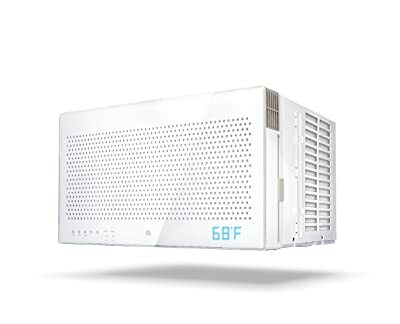 We’d highly recommend the Frigidaire 12,000 Btu Cool Connect smart portable air conditioner. 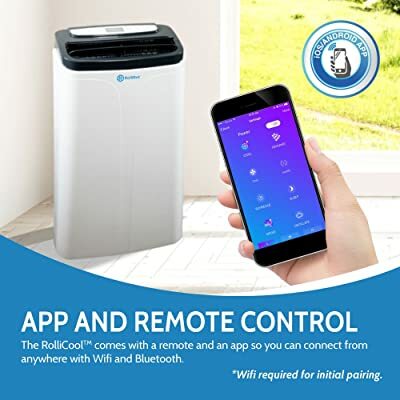 If you’re looking for a smart portable AC that can cool an area up to 700 square feet, the RolliCool App-Enable 14,000 Btu portable air conditioner may be the best option to consider. The RolliCool app connects to your smartphones via both Bluetooth and Wi-Fi. With this app, you can cycle through 3 different fan speeds, and open/close the air vents for more powerful cooling, and choose to set your temperature in either Celsius or Fahrenheit. For energy savers, the RolliCool app comes with a Timer mode and Sleep mode so that you can set times for the RolliCool to automatically turn on, as well as run the RolliCool more quietly for an easier time sleeping. The RolliCool air conditioner comes with a 14,000 BTU of cooling power. It also can dehumidify up to 4.8 pints an hour or moisture so you never have to deal with humidity again. This is ideal for the summer months when hot temperatures and high humidity can take the comfort out of your family cabin or beach-front vacation rental. Plus, this air conditioning unit comes with a dust filter that is easily washable. So that all you have to do is run it under the sink, dry it, and it’s good to go again. The RolliCool operates at 56 dB on the lowest fan setting. This unit isn’t the quietest portable AC we’ve reviewed, but 56 dB is low compared to other comparative air conditioners on the market. Many portable air conditioning units that we reviewed produced 65 dB or more. 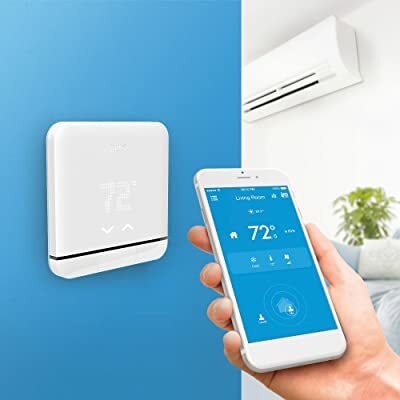 Tado smart AC control is an add-on device connects your smartphone to your air conditioner and makes it smart. With Tado, you will be able to control, monitor your AC from wherever you are with the mobile app on your smartphone or tablet. It controls the AC via infrared signals and connects to your home Wi-Fi. Simply plug in, connect to your Wi-Fi and select your AC brand and model – no further wiring or additional devices needed. If your air conditioner has a remote control, it will work with Tado, no matter it’s window, portable or ductless split air conditioner. You’ll able to control your air conditioner by your voice, using Amazon Alexa or Google Assistant, or bring products and web services together to create new scenarios with IFTTT. Tado App is available on iOS, Android, and Windows Store. You only need one tado device per room! Even if you have more than one AC that you want to control. This device just needs a constant line of sight between the AC units and it. If you have more than one AC in different rooms then all of the tado devices will be connected to your online account and they even talk to each other and bounce the WiFi signal. Tado will even recognize when you enter the room and cool just that room. The Tado helps you to turn the AC on when you get home and turn off when you leave. It’s one of the best additions to your smart home that helps to save energy and enjoy a peace of mind. Like the Tado, Sensibo Sky is an air conditioner controller. It lets you set as many schedules as you’d like. Turning on the heat as you wake up in the morning, cooling down the house before you arrive from work, and making sure the A/C is turned off when needed. If you have a regular home schedule, you can use the app’s seven-day scheduling feature to plan ahead for the week so that your home is always at the right temperature for when you or your housemates are around. It also ensures that it is off when no one is home, saving money on electricity bills in the long run. With Sensibo you can use phrases like: ‘Alexa, turn on living room‘ and ‘Ok Google, ask smart AC to turn off the bedroom AC‘. Sensibo has an extensive open API, with many extensions and integrations created by the community for SmartThings, OpenHab, Homebridge (for HomeKit) and more. Sensibo also works with IFTTT, so it’s easy to create recipes and new automation. There are so many positive reviews for this AC controller from experts on the internet. This is an excellent pick for anyone looking to add smarts to their current air conditioning or water heating system.